The Mirpur cricket stadium in Bangladesh shall verily remain a pilgrimage for cricketers and crickets lovers. 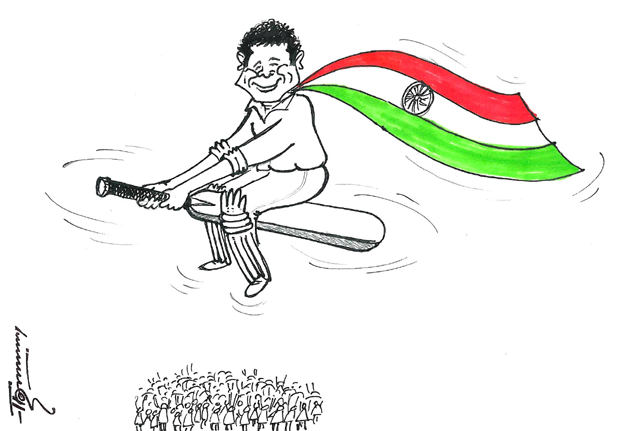 One swallow does not make a summer, but one Sachin Tendulkar makes Indians to sit up in great admiration to celebrate his 100th century in International cricket. If George Bernard Shaw would have been alive today and watched Sachin glancing Shakib al Hasan for a single to complete a hard earned century in Asia Cup at Mirpur stadium, Bangladesh against the hosts on March 16, 2012 he would have withdrawn his infamous statement, ‘11 fools playing in the middle and 11, 000 watching’ for it was not just 11, 000 but perhaps multiples of that number cheering across the world for Sachin’s superhuman effort. I was specially surprised to read accolades coming to Sachin from Lata Mangeshkar, Amitabh Bachan, Bapi Lahiri, Swami Ramdev ji who are equally charmed by this little master. Congratulatory notes by political stalwarts including PM, several CMs and others are issued by their Personal Secretaries, whereas the artists have issued these words personally. Great cricketers like Viv Richards, Adam Gilchrist, Mathew Hayden, Greg Chappel, Javed Miandad, Anil Kumble, Saurabh Ganguly, Chandu Borde, Dillip Vengsarkar, Javagal Srinath and many more have gone ecstatic to say words in praise of Sachin. Hearty congratulations to Sachin who has made millions clap for his astounding performance. We wish him more successes and more and more accolades to come his way. May his journey be longer in the game of cricket! Dear Harsha, 290 is not a small target. Why did the captain use Raina to bowl 9 overs, he is not a regular bowler. What was the need to drop both Harbhajan and Pragyan Ojha? And why the captain did not bring in Irfan as a pinch hitter after Sachin was out! It is easy to blame Sachin, but if you have played any game any time, you do not remember the points or the runs. The records just follow automatically. Do you see any logic to stick on to Dhaoni who has lost 4 series - WI, England, Aussies and now Asia Cup!! When Sachin played that slow knock , on a good batting track where a score of 300 is considered only to be on par, Sachin's innings perhaps cost us the game. He took almost 25 overs , half of the innings, for 114. The rest of the Indian team that got a chance to bat put together 165 in 25 overs !!!!!. If they had got the chance to play more overs , which Sachin wasted, perhaps we could have won the match ! Unfortunately we Indians tend to be short sighted ! We rejoice at personal records and dont bother much when India went out of Asia cup. Whenever Vivian Richards scored a century, West Indies never lost :).. In Michael Holding's words 'Vivian Richards was the only batsmen I know who could have broken every possible batting record in the book, but he never played for records'. Well compare that to our Indian players and see the contrast ! Dear Mr Robert, I do not condent whether you are right or wrong. I simply say 'bravo' to Sachin to have the technique, patience and concetration to play 147 balls! That ability alone has sepatayed him from other cricketers! Thank you, Professor Chandramouli to join me in cheering a man who has sweated over years, perfected over years and inspired thousands over the years in the great game of cricket. Years later, history will search for his footprints wherever he has played and ran between the wickets for a single or bowled his clever slow balls! Thanks Dr Kumarendra ji for your write up.Yes, as Indians we all feel proud of his accomplishment.Mr Roberts points out he scored 39% of runs.Agreed, he scored at least those 114 runs. What was the contribution of others, except Kohli and Raina?Why the bowlers could not check the so called minnows from scoring 289 runs, certainly a decent total to defend ?Has any one reckoned how many times Sachin was unjustifiably declared out by partisan umpires, when he looked certain to score a century? Let us not react like crabs in a basket pulling down those that endeavour to reach the top.This sort of attitude only forced India become a slave nation centuries ago. Let us be sportive enough to appreciate any one who does the country proud,sir.Sachin Tendulakar has been inspiring cricketers across the continents.Let us all pray for his success and players like him. The so called "Champion" plays 147 balls (almost 25 overs or half of the innings) and scores 114 runs or 39% of the total of 289. In my head it was more an exercise to achieve individual milestone than to play for the country. For @ one run a ball Sachin in this case was 33 runs short. Look at it guys, this man became resonsible for India to Loose the match to minnows and now is at a state of even wondering whether it will come in the finals. Was sachin playing for the country or for an individual record? And think about it carefully, what matters most!